Jon Stuewe, president of Molinos de Puerto Rico and Ramón Hernández, the company's sales director, receive the award. Jon Stuewe, president of Molinos de Puerto Rico and Ramón Hernández, the company’s sales director, receive the award. 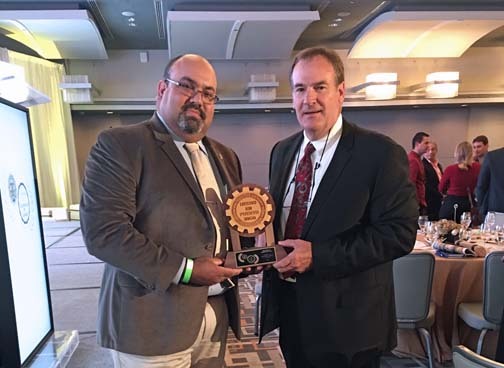 Puerto Rican company Molinos de Puerto Rico was named “Manufacturing Company of the year 2017,” an award recently bestowed by the Puerto Rico Products Association. “We are extremely proud to receive this award from the Association as it is the reward that receives our great team of men and women who work day by day with dedication in our company to elaborate with love our products” said Jon Stuewe, president of Molinos de Puerto Rico. Founded in 1958, Molinos de Puerto Rico has been a key player in the development of the food sector on the island, supplying raw materials to the bread industry, cookies and much more. Its main purpose has always been to preserve the tradition of dedication and commitment to the island and its customers. Its leading brand, “Amapola,” is a favorite flour product of the Puerto Rican consumer, the company said. Molinos de PR has managed to position itself as a leader in the bakery and specialty flour industry, having the backing of large production companies locally. Molinos de Puerto Rico has 100 employees directly and generates more than 5,000 indirect ones. “We’re committed to working hard to bring to Puerto Rican homes the same level of excellence in our products, but above all, we’ll continue contributing to the economic development of our [island],” Stuewe said. Hey Buddy!, I found this information for you: "Molinos de PR receives top PR Products Assoc. award". Here is the website link: https://newsismybusiness.com/molinos-receives-products/. Thank you.